It appears to be a regular day on the rehabilitation floor at Ridge Meadows Hospital. Staff serve meals and check on patients, while families visit their loved ones — all in a day’s work. 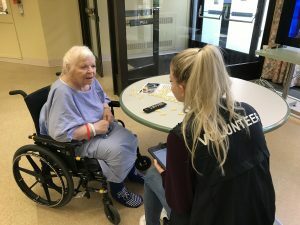 There’s something different on this day in particular, though: hospital volunteers, armed with iPads and positive attitudes, make the rounds at the bedside to ask important questions of patients and families about their stay. This is all part of a concerted effort by Fraser Health to take health care improvement ideas out of the boardroom and to the bedside through a partnership between patients, families and front-line health care teams. And the We Want to Hear from You: Real-time Patient Experience Survey is already making a difference at facilities across the Fraser Valley! 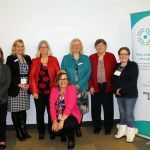 The survey project was the brainchild of the Fraser Health Regional Patient Experience team, in partnership with the Fraser Health Patient Advisory Council (recruited through PVN!). The Patient Experience team started with a literature search for brief, user-friendly surveys. They worked with plain language experts and signed up with a digital platform that would provide the flexibility needed for regional and local teams to run simple reports regularly. “We wanted to focus on how to support front-line staff into a deeper engagement with data” said Josh Myers, who is the Director of the Fraser Health Patient Experience team. He hopes that connecting staff to real-time patient and family feedback will create a culture of improvement. By using iPads as well as written surveys, hospital staff can make use of the results more quickly. The fact that the surveys are run by local hospital volunteers expedite this process even more! This means that teams can see the results shortly after the surveys are complete. After a screening and orientation process, the hospital volunteers who will be running the surveys are ready to head out onto the floor. The volunteers then seek feedback from patient and families who are keen to participate. “Volunteers are critical to the success of these surveys” said Jeffrey Chan, Clinical Services Manager at Royal Columbian Hospital, where volunteers have been surveying since April 2017 in their four surgical units to great uptake. “Our volume of surveys are typically 20-30 surveys a week and we use the data to make improvements, big and small”, explained Chan. At Royal Columbian, the teams are getting excited about a simpler way to see quality improvement achievements. Improvements that will be born from the survey will benefit hospital staff as well as patients. The survey has created a buy-in to these quality improvement practices from all levels of staff. Staff use the data for discussion, to identify trends, and to follow up with requests from patients and families in real-time. 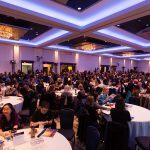 “The survey has demonstrated the power of human-to-human interaction and how that can improve a teams’ commitment to changing the culture to one that improves quality” said Terry Brock, the Regional Practice Leader in Social Work at Fraser Health. “We are really pleased with where we are at now and will continue to tweak to improve.” The success of the survey already shows: it was recently recognized as a 2018 Health Standards Organization Leading Practice! The volunteers are seeing the results as well. Garett Blanksma has been a key volunteer leader in conducting surveys on the rehabilitation floor: “I was interested in participating because it uses technology to be engage patients in their own care and demonstrates that Fraser Health values their input”. Overall, there have already been some small tests of change and larger commitments to quality improvement. The surgery ward at Royal Columbian Hospital has implemented a site-wide Quality Improvement Day to address opportunities. 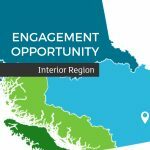 The successes in Ridge Meadows’ Rehabilitation Program have led to a region-wide commitment to conduct the survey in all rehabilitation programs in the region. Teams at both hospitals use the survey results regularly as part of their team huddles and ongoing improvement conversations. Fraser Health’s next big step is to conduct the survey across all home health programs. Being able to align regional and local priorities with the importance of the patient voice has allowed Fraser Health to demonstrate their commitment to be a person- and family-centred organization. Although still a work-in-progress, the partnership that is developing between leadership, front-line teams, patients, and families has the potential to transform health care through acknowledging the important role patients and families play in health care.